I went through your websites and your youtube channel and I wanted to congratulate you on all the great work you are doing for GNU/Linux. It is nice to see that there are people who put so much passion into this! I shared arcolinux.com with work colleagues and I will probably share it with more friends too. I am an arch user myself, but not all people have enough experience to run Arch and I think ArcoLinux is perfect for people with less experience. I’ve learned so much during the past couple months that my entire Linux experience has changed. I think everybody has that level where they feel helpless when confronting a problem they don’t know how to solve. Now my skills have advanced to the point that instead of throwing my hands up, I can methodically discover a solution. I’m sure I could have developed these skills without Arcolinux, but the fact is that this forum, the video’s, and the modular approach to Arcolinux have been just the right combination of source materials I needed to shine the light bulb over my head. I now have the comfort level to shake things up until they break so I can learn how to fix them. I have been playing around with Linux off and on since starting with red hat in the late 90s/early 2000s. In all these years I have never found a distro that I have been 100% satisfied with – That is until now!! Arcolinux is absolutely amazing! I can not fault it at all, it IS the perfect distro and I especially love i3!! It is also the first Linux that looks absolutely stunning!! The default theme for XFCE, OpenBox and i3 look incredible, very modern and have amazing wallpapers out of the box, along with perfect font rendering. The work you have done is incredible and your videos and tutorials are incredibly easy to understand. Now, not only have I been drawn back to using Linux again, I am also interested in learning more about it and customising my perfect ArcoLinuxB build. ArcoLinux is awesome! Schools at primary & post primary should be teaching computer courses in ArcoLinux. Children, teenagers & adults would learn so much about ArcoLinux from your excellent video tutorials. ArcoLinux is also a much better Linux learning environment than Ubuntu Linux. I will continue to spread the word about ArcoLinux. Thank you Erik and the team. Just wanted to say I installed Arco and immediately fell in love with it. It feels like arch to me but without the hassle of a manual installation and setup. Quite frankly, Arco has things I would love to see built into every operating system such as the image writer to USB and high levels of customization. Great package choices, I like vivaldi browser and so many of the other built in applications. Thanks for providing the Linux community with Arco and everything it provides! After discovering and testing several offices. I chose to stay on Awesome. I have a Macbook pro with a SSD and Awesome and a HDD or I try to make my own ISO. Thank you very much for all your work and your generosity, you are AWESOME. After a month of using Arcolinux, I can state the following: it’s the best of all Arch assemblies. You have to find investors and make your repositories and several programs. This project may have a future, as an alternative to Windows – I did not see anything better. Everything works perfectly right out of the box, all the necessary packages are already installed, a lot of attention to the little things. Thank you for the work, continue in the same direction. Good luck! Your videos are pure gold. Very few YouTube content creators for this subject matter are as meticulous with their documentation and work flow as you are. Your sites and work continue to improve over time, not to mention that they started as a solid foundation to begin with. Your git code is nice and clean, aka… stuff just makes sense. Keep up the good work producing the Arco content. I am especially enjoying the Bspwm related content! Looking forward to the future and the completion of all six phases that you outline on your website. I will continue to direct friends and family to your work so that they too can partake in the fun. Thank you, sir! Arch Linux installation worked like the very 1st time. Huge THX! Believe this – I’ve watched most every YouTube installation video, and combed through dozens of online howtos, to no avail. 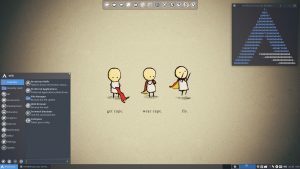 I’m new to most of this, I stopped at adding a graphical — I’m truly not ‘there’, yet, understanding the differences between a Window Manager (DW), a Desktop Environment (DE) — whatever… Anyways, thx again. Really. If it wasn’t for the way that you encourage people to take on Arch-through subtle progression-I’m not so sure I would’ve be as confident as I was going into a stock Arch install. After graduating myself from your Merge/D classes, I now run standard Arch with XFCE and OpenBox and have had a really smooth transition with all of yours and even Distrotube’s help. Such a nice way to learn Arch/Linux. Really is game changing. Thank you. Just wanted to thank you for all the videos and the effort you put into them, your channel has helped me greatly and your customization videos got me into Linux. I’ve been using Linux on my laptops for a number of years. But that has been it: just using it. I’ve Distro-hopped. I’ve learned package management for various Distros. I once installed Arch but followed a step by step guide. And so I have ended up bored as I’ve always wanted more from Linux. Then, tonight on Distrowatch I discovered ArchMerge. I’m installing it as I type this and aim to follow the learning path to greater joy in Linux. ragazzi @ArchMerge – è l’essenza di ciò che dovrebbe essere un sistema operativo! Thank you for these educational ArchMerge how-to videos. I’m learning a great deal from your ArchMerge videos. I’m late to the party, but I have to say THANK YOU! ArchMerge is amazing. The work that obviously went into it is brilliant, and I can’t imagine how much it took, but the end result is one hell of an outstanding Arch spin with a great aesthetic. Fantastic! I definitely intend to go the ArchMergeD route when I have more time. Mastery of desktop and tools is the goal for me, and this gets me very much closer, so thank you! Just want to say that I think your ArchMerge project is great! I am a longtime ubuntu/mint user and was always fascinated by Arch, but also always to afraid to use it on my production systems. Your project is EXACTLY what i was looking for. Am eager to dive into phase 1. Thanks for your good work and please keep it up! I just wanted to let you know that I really appreciate the initiative of archmerge! I’m already using i3 on Mint and wanted to jump to Arch. That’s a perfect start for me ! I love your work. Thank you for all your effort on providing a really nice Arch option. More than that, thank you for offering your knowledge so that I can learn. Really appreciated. … and this is what it takes to be top notch distro. Check out distrowatch… dedication there! Hope to see #Archmerge at the top of the charts. …I just wanted to express my appreciation for a fabulous distro. What MX has done for the Debian base you have done for Arch. … and could not be happier with all the customization and packages provided. … Outstanding work my friend, and thanks for all the helpful videos you are putting out. I decided to try ArchMerge (6.1.1). I was surprised how beautiful it is already. Out of the box. And – non-the-less- all the conky’s in all its glory. Conky’s are something I cannot make work and display correctly if I dare to install it by myself! I really like the idea of ArchMergeD. It has allowed me to get up and running with a pure Arch installation quickly. In my opinion, it is the smartest and most time saving way to install arch. Thanks for all the great tutorials and great job on this unique distribution. Loved ArchMerge, having fun with ArchMergeD. Your Arch Linux Is One of the Best I Have Ever Used Broh. Really Appreciated for my daily usage. ArchMerge is well worth a look especially for those who are new to the Arch experience. This i3 config file is a work of art. Absolutely beautiful. I have installed ArchMergeD i3 and love it. For anyone who thinks they cannot do it, please reconsider. I am a no-tech-savvy woman, beginner in Linux, who followed your instruction and had no trouble installing or using i3. You have done a fantastic job putting it together. Thank you very much for all the time and expertise that has gone into the making of i3 and the extremely helpful tutorial videos. Fabulous job. Thank you. Very nicely set up Arch install. Enjoying it. Well done. Like ArchMerge so much that I have put it on my 3rd PC. I have just installed ArchMerge as of two days ago, as a long time vanilla arch user I have to say that I am loving it. You’ve made an absolutly fantastic distro here and I have decided to move over to it full time as my daily use distro. Thank you again for all the work you and your team do on this project! It does not go unnoticed! The amazing attention for detail you have in developing ArchMerge is amazing, and really deserves more credit and recognition. Keep at it!